Add thrills to your vacation itinerary with the excitement of parasailing in Hawaii! 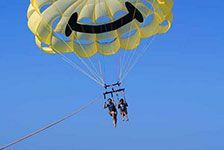 ReserveHawaii.com offers great deals on Hawaii parasailing adventures. Book yours today!